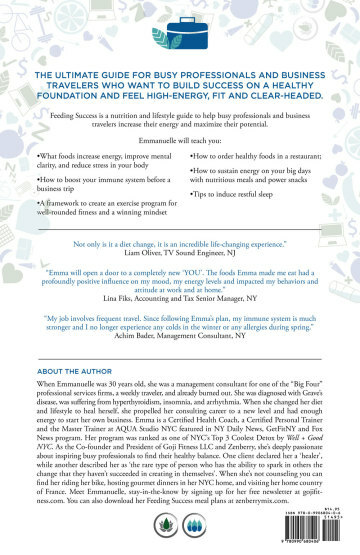 My Book: "Feeding Success: A Nutritional Blueprint To Fuel Busy Professionals and Business Travelers"
"There is a new type of business professional emerging globally. Fit, strong and in-the-know on how to maintain peak performance. "Feeding Success" is your ticket to joining that emerging business elite, where work truly becomes high play, and the food you eat, the exercise you deploy and the mindfulness you employ become potent aspects of your recipe for success." Laura J. Brown, Author of Dragon Eyes. 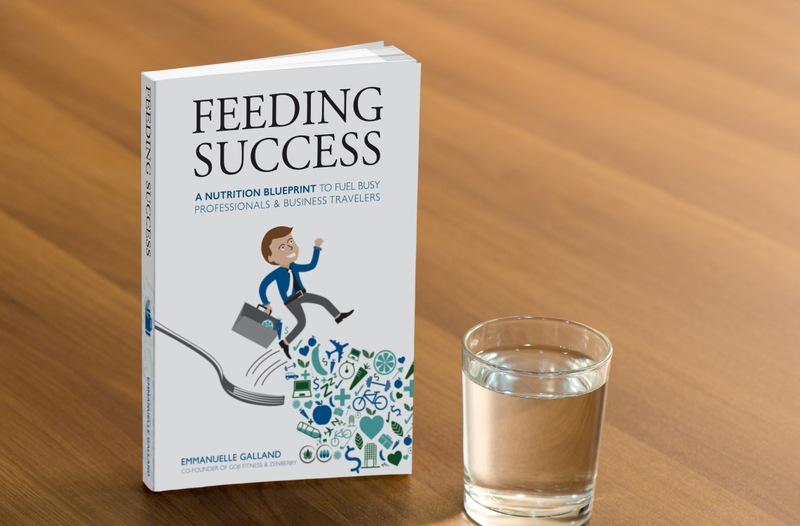 Feeding Success is a nutrition and lifestyle guide to help busy professionals and business travelers increase their energy and maximize their potential. It is also the story of overcoming and auto-immune disorder and burnout with empowering dietary and lifestyle changes. How to sustain energy on your big days with nutritious meals and power snacks. Click HERE to meet Emmanuelle and see her short video describing what enabled her to write this book: her upbringing, professional and personal journey. "Truth be told, I wish that Emmanuelle Galland had written this book ten years ago. That was exactly when I was closing my business and my blood pressure was soaring at stroke level numbers. Not trusting a medical community that wanted to put me on medications without helping me alter my lifestyle I had to figure it out for myself. Disease caused by stress in the corporate environment and by the constant traveling is much more common than people imagine. In her book , Emmanuelle lays out a simple roadmap that will help you feel balanced, relaxed, healthy and successful in a very short amount of time. I would also recommend it to anyone that has a job! I could tell by what I was reading that if she's your coach, that she's 110 percent committed to your success. If you work fast and hard, she's definitely who you'll want by your side!" "I loved this book and now my husband is reading it, too. What a fantastic tool for any business person who wants to have more energy, be more creative and clear-thinking at work and in their personal life. Well written, inspiring, held my attention. It's a fairly quick read - I read it cover to cover on one travel day from New York to Chicago. But I will keep it handy as a reference. Feeding Success contains checklists, journal prompt workbook sections, 4 Day workout plan for travel, 4 Day easy menu plan, healthy snack suggestions. I love the idea of having Monday - Thursday be Power Days and the concept of Goal-Directed Nutrition. No longer am I just trying to avoid a certain junk food out of sheer will power - now I have a purpose: my need for high energy to get the most out of my work day! I am going to start to consider myself as an athlete and my "sport" is having the high energy needed to be my best at my work". - Mary J Hahn. “My job involves frequent travel. Since following Emma’s plan, my immune system is much stronger and I no longer experience any colds in the winter or any allergies during spring”. Service DescriptionFeeding Success is a nutrition and lifestyle guide to help busy professionals and business travelers increase their energy and maximize their potential. It is also the story of overcoming and auto-immune disorder and burnout with empowering dietary and lifestyle changes. Word of mouth is how a young author's voice spread. Will you be so kind to leave me a review to help my message increase its reach? Thank you!